What I'm about to say may shock you, and it may worry you, but here goes...your therapist is not the expert. If you've ever been a client of therapy, maybe you've wondered about the other life your therapist leads. I know when I was in therapy I was curious about my therapist! I mean, we're human, we're curious by nature. But I'm about to potentially break some news to you that, well, may not sound so great. Your therapist does not necessarily want to see you in public. Your therapist does not want you to know about his or her personal life. I know, it stings a little. But let's think about this for a second - therapy takes place within a safe, confidential environment. Whatever the client presents within a session is what the therapists holds to be true, and that's what the therapist works with throughout the time that the therapeutic relationship exists. This is a very specific and protected interaction which is based solely on those 50 minutes. No, your therapist is not going to Google you, or try to find your Instagram. My training, and I cannot speak for every therapist, states that this kind of behavior would be unethical and honestly, cause a conflict of interest. Realistically, clients don't tell their therapists everything about them, or at least everything right away. And that is ok! Therapy is a place where the client can feel safe and share freely without the fear of being judged - that's key! Now, all of this isn't to say that your therapist doesn't care about you - of course they do! But in a different way. Therapists are trained to have appropriate, clear boundaries with their clients, as well as with the work itself. A therapist should try not to bring their work home with them, and should have something that provides meaning in their life outside of their work. It's all about a healthy balance, and avoiding taking on too much. You've heard the phrase, "you cannot help someone else until you've helped yourself" - the same rings true for therapists. We must maintain healthy mental and physical health so that we can efficiently help others. As for the therapist sharing personal information, this may occur naturally and appropriately in more of an anecdotal form. As my background draws from Feminist Theory, I tend to be more transparent with my students and will sometimes share personal details when I feel that it is relevant to the client. I'm very careful with what information I share, and ensure that there is a purpose behind each statement. This can help build rapport but it also allows the client to feel as though it is an equal playing field. For me, being a therapist does not mean that I know more than my client, or that I am better than my client. 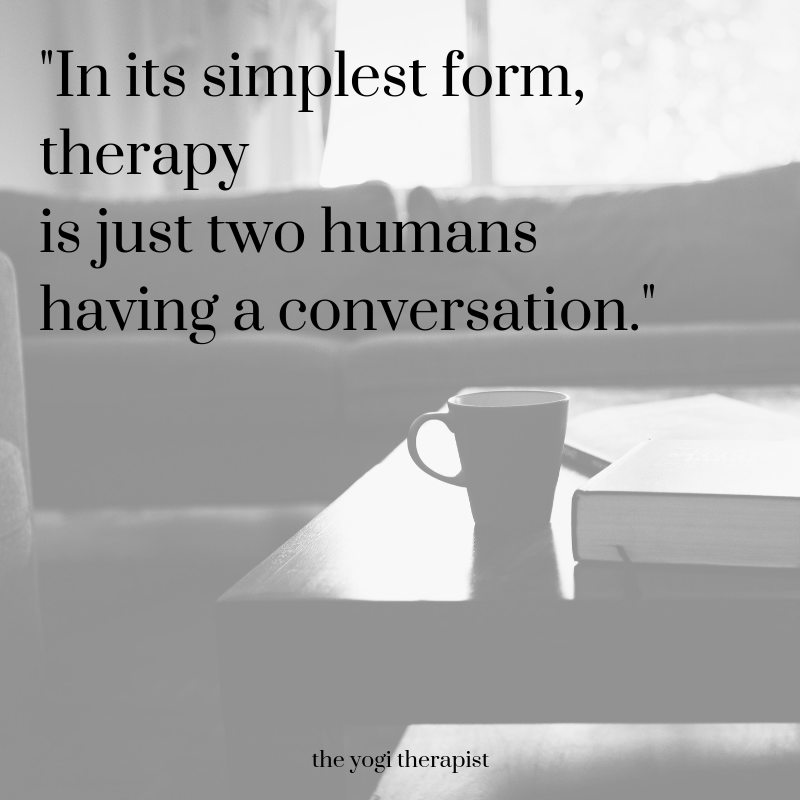 In it's simplest form, therapy is just two humans sitting and having a conversation. We are just catching up, and maybe every once in a while I can reflect something that invokes an increase in insight in my client. So if you are in therapy, try to keep in mind that these boundaries are in place to protect you and your therapeutic experience. It is out of respect for you, the client, as well as the therapeutic process.